From left, Wesk Medical team members Stephen Robinson, Esmaeel Paryavi, Kaiyi Xie, Bernard Wong and Walter Beller-Morales celebrate capturing first place in the Fischell Department of Bioengineering 2012 Capstone Design Competition. 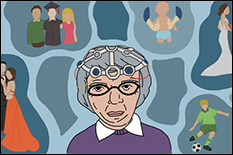 "The engineers bring the ability to design devices, while the medical school and pharmacy school bring a sensitivity to patient-use issues." By Beth Panitz. Reproduced with permission from E@M, 12(2):20, Fall 2012. 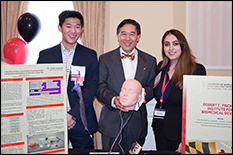 It's a winning combination: teams of talented Clark School bioengineering students working closely with physician-mentors from one of the nation's leading healthcare institutions to solve pressing medical problems. A partnership between the Clark School's Fischell Department of Bioengineering and the University of Maryland School of Medicine is pairing undergraduates with physicians in a two-semester Senior Capstone Design course in which students must create innovative engineering solutions to problems that impact patient care. The partnership is yielding impressive results. 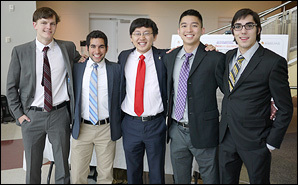 Mentored by Jeffrey Hasday, M.D., professor of medicine and the head of pulmonary and critical care at the University of Maryland School of Medicine, five bioengineering students have created a patent-pending device to deliver drugs to patients with respiratory failure, the third leading cause of death in the United States. Their invention led to the launch of Wesk Medical, LLC, a start-up company specializing in medical device development. "Bioengineering and medicine are so intricately and inexorably tied together that it makes for a natural collaboration," says team member Kaiyi Xie, B.S. '12, bioengineering. "Through the partnership, we were able to identify a real medical problem and take off from there." Drawing on his 26 years of critical care experience, Hasday helped the students identify the need: Patients experiencing respiratory failure are often intubated—an endotracheal tube is placed through their mouth or nose, bringing them oxygen from a respirator. When those patients require inhaled medications, the endotracheal tube poses physical obstacles, making drug delivery to the lungs inadequate and unpredictable. "Academic studies show that only one to four percent of drugs reach patients' lungs, and we are not sure how much is absorbed," says Xie. With Hasday's guidance, the students developed a solution: the endotracheal aerosol-generating catheter (ETAG). The tiny catheter—only a couple millimeters wide—is threaded down the endotracheal tube, delivering droplets of liquid drugs to a microchip at the innermost tip of the tube. The chip uses surface acoustic waves to vibrate the droplet, nebulizing it into consistently and optimally sized aerosol particles for delivery to patients' lungs. The students also are collaborating with University of Maryland School of Pharmacy Professor and Associate Dean Richard Dalby, whose lab specializes in evaluating aerosol-based drug delivery systems. "There is real value in these types of collaborations," says Dalby. "The engineers bring the ability to design devices, while the medical school and pharmacy school bring a sensitivity to patient-use issues." Hasday, a member of Wesk Medical's management team, describes the start-up as "the perfect example of bioengineers creating and implementing ideas with clinical solutions. As we move through the product development phase, our long-term goal for this product and others is to reach the marketplace and improve the quality of care for patients." The team relied heavily on the entrepreneurial experience of members Esmaeel Paryavi and Bernard Wong, both B.S. 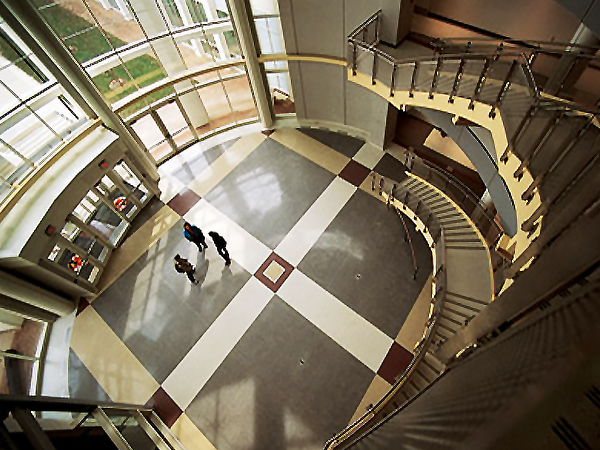 '12, bioengineering, who were enrolled in the Hinman CEOs program, the nation's first living/learning entrepreneurship program. 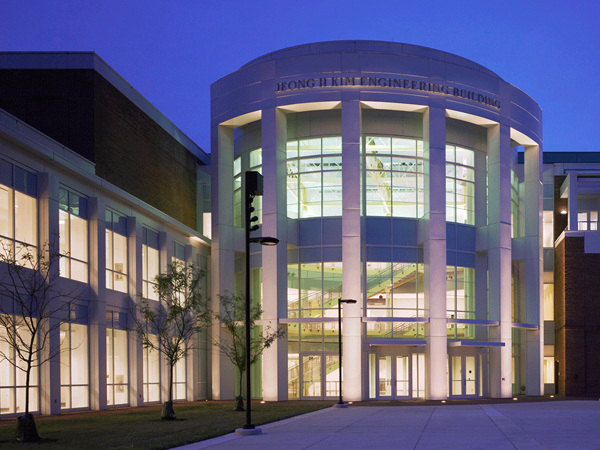 The program, which is part of the Clark School’s Maryland Technology Enterprise Institute (Mtech), gives entrepreneurially-minded students from all disciplines the tools for launching a new venture. "We were passionate about starting this company," says Walter Beller-Morales, B.S. '12, bioengineering. "While we were working out the engineering aspects of the device, we were going through the steps of getting the company off the ground." The bioengineering capstone course also gave the students a basic primer on how to bring a medical device to market, covering such topics as obtaining Food and Drug Administration approval, seeking venture capital, and addressing legal concerns. In addition, the team was inspired and motivated by bioengineering department benefactor and namesake Robert E. Fischell, who offered advice on biomedical entrepreneurship as a guest lecturer for the course. A $5,000 grant from the Warren Citrin Impact Seed Fund and a $500 prize in the 2012 University of Maryland $75K Business Plan Competition are helping to fund the start-up. "We look forward to licensing our invention and producing a revenue stream that will help us design other life-changing biomedical devices," says Xie.